It was whilst studying Politics at University in the mid 1970s that Capricorn Research first discovered Astrology. Within weeks the college drop out rate had been increased by one person with an obsession to find out how the world really worked. That first year course wasn’t entirely wasted. One thing was learnt, which can best be summed up by the old anarchist slogan ” If voting, changed anything, they’d abolish it “. In the 40 years since then, even the study of astrology hasn’t altered this view. Not convinced ? 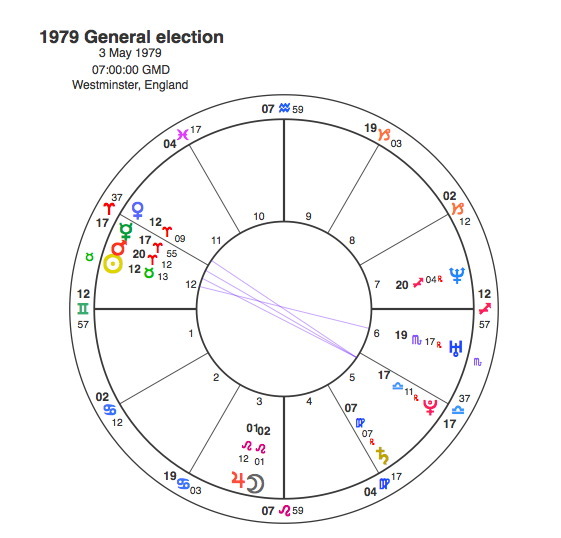 Well ask yourself why the UK elections are invariably held in the first week of May, the middle of Taurus, the most conservative and fixed sign in the entire Zodiac. In fact since the last election, the Conservative government have introduced fixed term elections, thus probably condemning us to Taurean parliaments forever. Is the timing deliberate ? Of course it is, these old Etonians may be idiots, but they’re not stupid. Fortunately for us, their understanding of astrology is about the same level of the rest of the population, i.e. entirely limited to their Sun signs. There are two ways that we can look at General Elections. The first is to check out the transits to the charts of the party leaders. The second is to treat the election just as we would a battle or a football match and draw a chart for the moment the polls open to see who would be the winner. In this case we would treat the chart in the same way and consider the planet that rules the Ascendant for the incumbent party, the planet ruling the 7th for the challenger, and the Moon. A good place to start would be with the 1964 General Election, because it brought a change of government for the first time in 13 years but also it marked a change that seemed very much in tune with the zeitgeist at the time. The decade of the 1960s was and still is considered to be a powerful symbol of change. This is entirely the result of the Uranus / Pluto conjunction in Virgo that peaked at the middle of the 60s. With Virgo’s connection with work it is hardly surprising that the Labour party came to power in October 1964, and won a second election in March 1966. The background to the 1964 election is interesting. The Conservative party had been in power since 1951, and much of this time had characterised by the post war recovery and Prime Minister Harold MacMillan’s declaration that “ You’ve never had it so good “. The early sixties, however had seen the party racked with scandals like the Christine Keeler affair and there was a strong sense that it was time for a change. Macmillan became ill and resigned in October 1963, to be replaced by Alec Douglas – Home, a typical old school Tory who seemed even more out of touch with the common man than the rest of them. Home lasted a year. Home had the Sun in Cancer, a sign that is very attached to its roots and wants desperately to hold on to what it has, so it would make a classic Conservative politician. His Sun is in conjunction with Neptune, a planet which doesn’t work so well in the world of politics and is likely to undermine a career at the very top. Home’s short time in the top job coincided with Jupiter being square to his Sun and opposite his Moon / Mars conjunction. But this was well and truly over by October 1964. Harold Wilson’s chart is completely the opposite. He had the Sun in Pisces and the Moon in Gemini, both Mutable signs strongly connected with change. He also had Mercury conjunct Uranus in Aquarius, a perfect placing for the leader of a socialist party. Pluto’s conjunction with Wilson’s Ascendant shows his role in changing the face of British politics. Many people believe that the election was won a year earlier when Wilson made his conference speech calling for a new Britain to be forged in the “ white heat “ of a technological and scientific revolution. The fact that Wilson was an essential part of the changes that had to occur in Britain in the mid sixties is confirmed by the fact that the Uranus / Pluto conjunction fell opposite his Sun and square his Moon between late 1964 and 67. This was the absolute astrological turning point of Wilson’s life, and a cast iron guarantee that he would win both the 64 and 66 elections. The charts for the poll opening merely confirm this. Venus for Douglas Home is in Virgo the sign of its fall in the 11th house of politics, but also applying to the Uranus / Pluto conjunction. This is such an obvious sign that he is about to give up his premiership to the Labour party ( Virgo ). 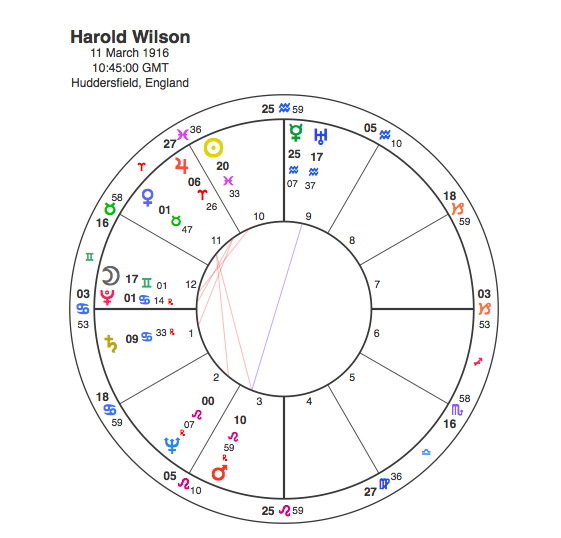 Mars for Wilson is in Leo in the 10th house of the statesman and a clearer indication that he was about to become Prime Minister could not be imagined. The Moon is in Aquarius showing that the country is ready for a change and it makes no aspect to Home’s Venus but it does go to aspect Wilson’s Mars giving the contest to him. Astrology is so simple it can be easily understood by an 8 year old, a fact that Capricorn Research has always found infinitely helpful. The only reason that most people find it difficult is because their heads are so stuffed full of other irrelevant rubbish. All you have to do is let your mind quieten down a little and reflect on the symbols for a while and the whole of nature’s intention is revealed simply and honestly. 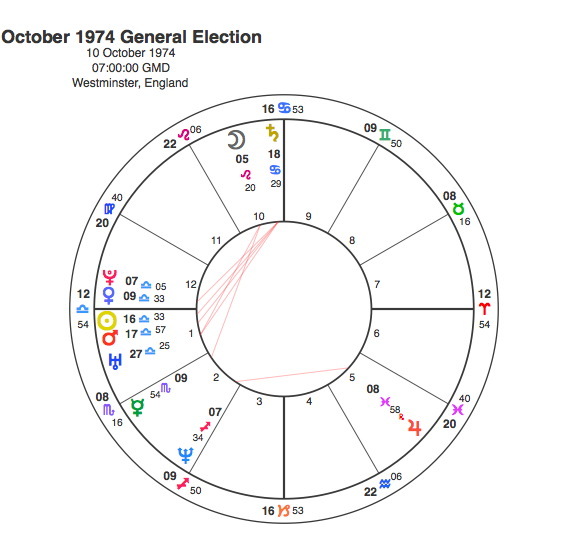 It is interesting that despite all these astrological indicators of major change, the Labour party only gained a majority of 4 seats, a testimony to the underlying power of conservatism within the English culture of the time. Wilson was of course prime minister now and so ruled by Mars, dignified in Aries and closely conjunct the Ascendant, this single fact alone would guarantee him to keep the top job. Edward Heath, the newly appointed Conservative leader was represented by Saturn, weak in Pisces in the 12th house. The Moon is in Cancer, a simple sign that no change at No 10 would occur and it was Void of Course which means that nothing would come of the election. Wilson retained his prime ministership with an increased majority of 96 seats. By 1970 however, the optimism surrounding Wilson’s appointment had dispersed. Economic difficulties had forced austerity measures on the government and restricted their plans to introduce many socialist projects. The devaluation had lost some of Wilson’s support despite his protestations that ‘ the pound in your pocket “ would not change value. By 1970, Uranus had separated from Pluto and it was square to Wilson’s ascendant for the time of the election, indicating that it was time for a change. Edward Heath with the Sun conjunct Saturn in Cancer was another perfect symbol of the old school Tory politician. 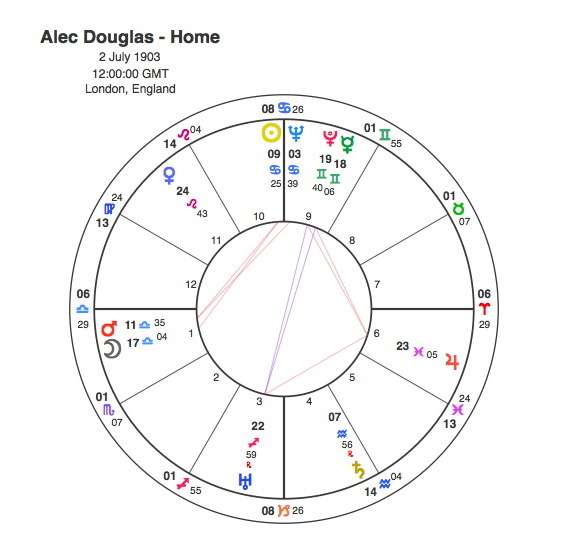 The Sun’s conjunction to Saturn however meant that he would stay around for a lot longer than Alec Douglas Home. In fact Pluto in 1970 was just starting a transit in square to Heath’s stellium of planets beginning with Mercury. In 1970 Jupiter was also conjunct Heath’s Moon, a strong indication that he would succeed in the election. 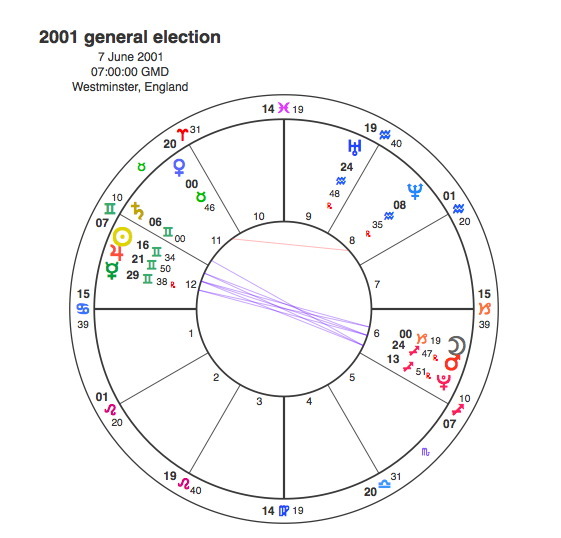 The chart for the election is less conclusive than the other two, but the simple fact that both the Sun and Moon are in mutable signs shows the appetite for change. There’s no obvious connection with Aquarius or Uranus and Pluto this time as its a change backwards towards the forces of conservatism. The period that followed Heath’s appointment was a difficult one with a series of strikes in the power industry culminating in the enforced introduction of 3 day working week to conserve energy. Heath was basically forced to call an election in 1974 to decide who governs Britain, the government or the unions. One interesting factor in both Heath and Wilson’s charts is that their Ascendants were in square aspect, Heath at 6 degrees Aries and Wilson at 4 Cancer. They also had Pluto / Ascendant aspects, Wilson the conjunction, Heath the square. In 1974, Pluto reinforced these natal contacts by being opposite Heath’s Ascendant and square Wilson’s. The advantage in Wilson’s natal Pluto / Ascendant aspect was probably what gave him the two elections that were held in that year. The election in February 1974 brought an odd result. The Conservatives won the most votes but Labour had more seats. Heath tried but failed to arrange a coalition with the Liberals and the result was a minority Wilson government. The chart reflects this state of affairs. The Sun is conjunct the Ascendant in Pisces square Neptune, an appropriate astrological symbol of a contest from which there appeared to be no clear winner. Both Jupiter for Heath and Mercury for Wilson are in weak signs in the 12th house. So the indication is that either party attempting to form a government would inevitably be weak. The Moon is in Taurus which suggests no change, and goes on to square Jupiter suggesting a victory for Heath, but Jupiter is part of a T Square that also includes Mercury. The Moon moves on from Jupiter to conjunct a third party in Mars. Mars is in Gemini, a nice symbolism for the liberal party as Heath suggested they twin up to form a government. Mars however is opposite Neptune, an indication that such a partnership would not materialise. This opposition focuses by T Square onto Mercury. So the net effect of Heath’s attempts to form a coalition is that Wilson ( Mercury ) becomes leader. Wilson now as Prime Minister is symbolised by Venus in dignity in Libra and also conjunct the Ascendant. 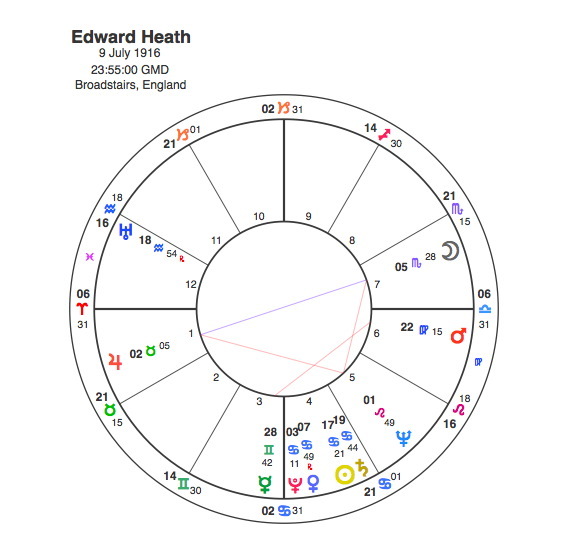 Mars for Heath is in detriment in the same sign and is also conjunct the Ascendant, but this shows that Heath is under Wilson’s power. The Moon applies first to a sextile to Venus so Wilson wins the election. Labour won by only 3 seats but at least they had an overall majority. Wilson resigned in 1976 to be replaced by Jim Callaghan. Callaghan had an interesting chart for a political leader. The Mars / Pluto conjunction indicated the astrological power that would propel him to the top job, but also the political explosiveness of his time in office. This combination being in Gemini indicated that his time at the top would not last long. He had the idealistic Moon / Neptune conjunction but this often points to an inability to see what everyone else can. His whole premiership was covered by Neptune’s transit in square to his Ascendant. The end of his tenure was characterised by transport and bin men strikes and the lasting images from the time are of rubbish in the streets and reports of bodies lying unburied in mortuaries. As all this was just starting to escalate, the prime minister had gone to an economic conference in Guadeloupe in the West Indies. Looking tanned, Mr Callaghan returned to be asked how he was going to deal with the problem. “I don’t think other people in the world would share the view [that] there is mounting chaos,” was what he actually said. but he was reported to have said “Crisis? What crisis?”, 3 words that surely hammered the final nails in. Of course the one person who benefitted most from this was Tory leader Margaret Thatcher. Thatcher has managed to achieve the remarkable feat of being Capricorn Research’s most hated person and most loved astrological chart. In fact it is probably true that the utter and total conviction that this writer has with astrology owes more to this chart than any other single one. It is for this reason only, that a remarkably unbiased article on that dreadful woman could be written. Its interesting that Callaghan’s Moon / Neptune conjunction contributed to an idealist who was sadly out of touch with reality. Thtacher has the same combination, but it is in the much more assertive and dominant sign of Leo, and a sad reflection on the British collective psyche that her hallucinogenic view of reality was shared by so many people. She caught the Zeitgeist however in a much more powerful way than Wilson, or indeed any other politician in living memory. This was entirely due to Pluto being conjunct her apex Sun in 1979. The chart for 1979 shows Mercury for Callaghan in Aries ( his Sun sign ) in exact opposition to Pluto in Libra ( conjunct Thatcher’s Sun ). 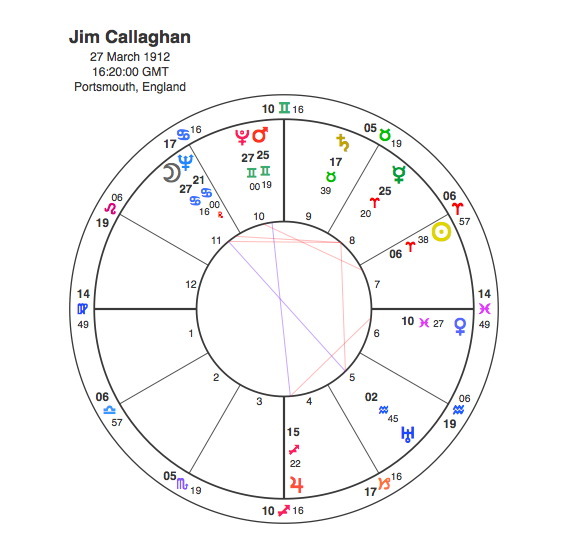 The Moon has just moved out of Cancer ( Callaghan’s Moon sign ) into Leo ( Thatcher’s Moon sign ) and it is in exact conjunction with Jupiter symbolising Thatcher in the 1979 chart. A clearer indication of a major political handover would be hard to imagine. After an unbelievable period of infighting that consigned Labour to 18 years of opposition, Michael Foot was elected leader. Politics in these times was something you could really get your teeth into, everyone knew where they stood, their leaders were polarised not like the anodyne bunch that run the political parties these days all trying to fight on the same ticket. This astrobituary of Tony Benn gives a flavour of things. 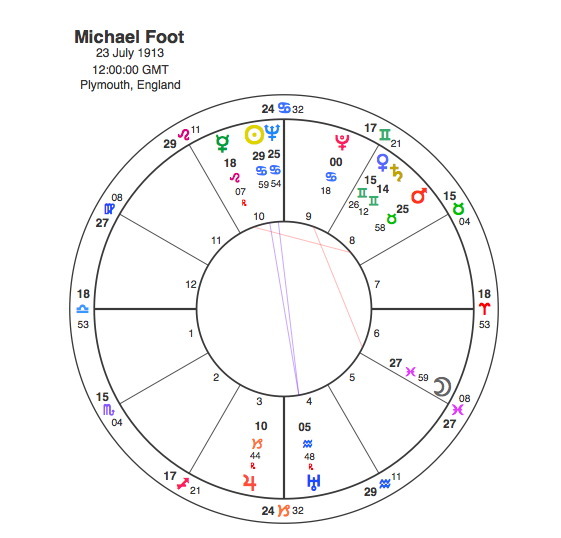 Talking about being out of step with political reality, Michael Foot had the Sun conjunct Neptune in Cancer in trine to the Moon in Pisces. He was a much loved politician despite or perhaps even because of his wearing a donkey jacket to the Remembrance ceremony in 1981. Just like Callaghan’s crisis, it wasn’t actually true and even the Queen Mother, is said to have complimented Mr Foot on the garment, telling him that it was “a smart, sensible coat for a day like this”. Thatcher worked the country up into a seething jingoistic rabble through the extraordinary manipulation of the Falklands War when its painfully obvious that this could have been settled diplomatically. 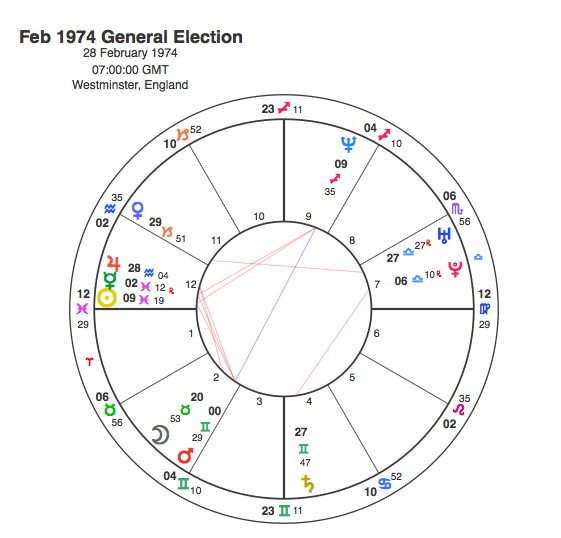 Capricorn Research has never felt so out of step with his fellow humans as during this episode but Margaret Thatcher rode this ” crisis ” and went from being one of the most unpopular Prime Ministers in history to being a shoe in for the 1983 election. 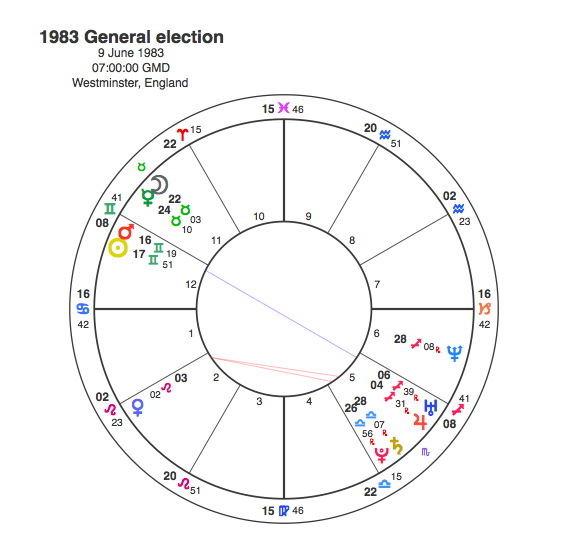 The chart for the 1983 election could not be clearer, the Moon for Thatcher was in Taurus, certainly not for turning or being turfed out. Saturn for Foot was retrograde ( going backwards ) and heading for Pluto, the end of his time as leader of the opposition. His replacement was Neil Kinnock, an Aries / Leo combination that would be far more effective than Foot at taking the fight to Thatcher. He had Jupiter trine his Moon in 1987 but this was not strong enough because Thatcher had it opposite her Sun and Mars. The other problem was Neptune was square Kinnock’s Sun, which is never going to be a vote winner. 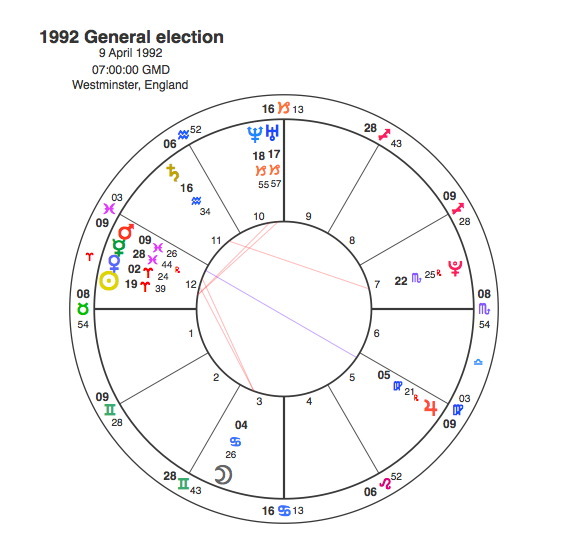 The chart for the 1987 election was an interesting one as both significators, the Moon and Saturn are applying to each other. Saturn for Kinnock is certainly weaker as it is retrograde. As the Moon is Thatcher’s planet we can’t use it to show the outcome, but Mars conjunct the Ascendant is probably enough to give her victory. The main aim of the Labour party was, arguably, not to win a majority of parliamentary seats but simply to re-establish themselves as the main progressive centre-left alternative to the Conservatives, after the rise of the SDP forced Labour onto the defence. So a strong showing as the 2nd party was probably considered as a victory of sorts. Kinnock’s Leo Moon was part of a T Square. The Moon was opposite Venus, these are the most important planets when it comes to popularity and identification with the electorate. In opposition however, particularly with a Leo Moon it leads one to be over confident about this state of affairs. The opposition focuses by T square onto an apex Saturn which indicates that it contributes to his own downfall. This played a major role in the run up to the 1992 election with Pluto creating a Grand Cross to his Moon / Venus / Saturn. Pluto was square Venus and opposite Saturn as opinion polls showed a clear Labour lead, no doubt contributing to the triumphalist “Sheffield Rally”, where Kinnock famously cried out “we’re alright!” three times. Unfortunately for Kinnock the voters took more notice of The Sun, who ran a series of anti-Labour articles that culminated on election day with a front page headline which urged “the last person to leave Britain” to “turn out the lights” if Labour won the election. 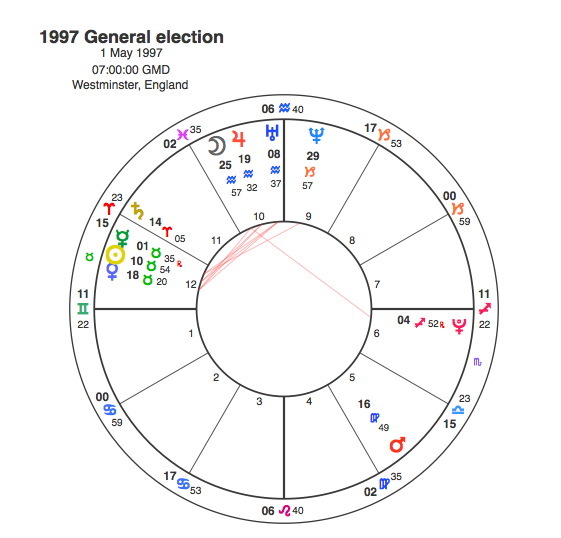 The 1992 election chart is very interesting because it shows that Neil Kinnock’s optimism was justified. Venus for Major was in detriment in Aries in whilst Kinnock’s Mars is also weak in Pisces, the Moon is applying to trine Mars so he should have won. Why didn’t he ? Mars is opposite Jupiter, showing the over confidence of the Sheffield rally. Note that the Moon makes a sextile to Jupiter before it reaches Mars. But this on its own would not halt a Labour victory. This brings us to a very strange phenomena that frequently comes up in contests charts in a way that will often powerfully influence events. It is the mutual reception, a situation where two planets are placed in each other’s signs. In the 1992 chart, Mercury in Pisces and Jupiter in Virgo are in mutual reception. This relationship creates a kind of astrological quantum jump so when the Moon reaches its sextile with Jupiter ( Labour’s over confidence ) it jumps straight to its partner Mercury ( creating a late opinion poll change of mind ), thus bypassing the aspect to Mars ( Kinnock ) and going on to contact Venus ( Major ). This may seem like a far fetched interpretation of the situation but its amazing how frequently mutual reception will alter a chart like this. This defeat was the end for Kinnock. The next election ushered in an entirely new kind of political figure, the manufactured TV image of Tony Blair. Image is of course an Ascendant issue and what better way than to project a strong but friendly image than to have Mars and Jupiter together on a Gemini Ascendant. Saturn’s conjunction with Major’s sun and its square to his Moon and Ascendant in early 1997 indicated that the end of a peculiar career had arrived. Pluto’s opposition to Blair’s Ascendant / Mars conjunction meant that he was to be the new face of British politics. 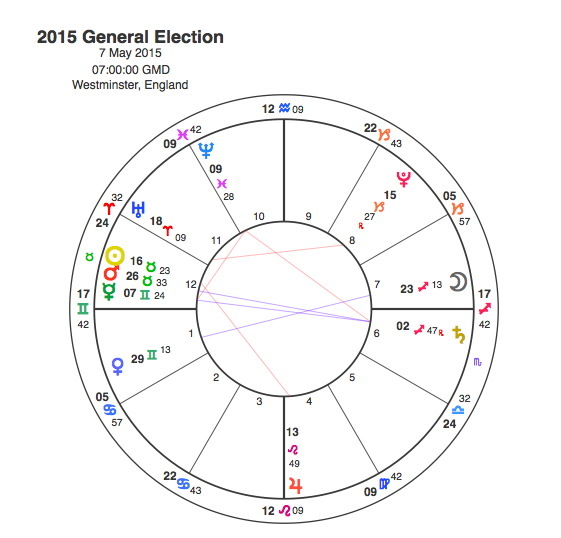 The election chart showed Mercury for Major weak in Taurus and retrograde and combust. Blair’s Jupiter was in the 10th, a sign that he would take the top job. The Moon is Void of Course with no more aspects to make before it changes sign. But it is conjunct Jupiter so another sign that Blair becomes Prime Minister. One of the common Sun / Ascendant issues is that there is invariably a difference between the image projected ( Ascendant ) and the essential person behind it ( Sun ). Nowhere is this difference more pronounced than in the chart of Tony Blair. Behind all that Mars / Jupiter / Gemini Ascendant, was a hidden a 12th house Taurean Sun, a classic symbol of a closet Tory if ever there was one. Even more scary is that this Taurus Sun was the apex of a Moon in Aquarius opposite Pluto T Square. Blair actually had two T squares, the other one with Uranus as an apex. This combination creates a conviction politician of great fixity and intensity, someone whose ideals would be completely unshaken by anything, least of all the non existence of weapons of mass destruction. It also conveys a strong capacity to last the pace which of course he did, like Thatcher winning three elections. The first in 2001, saw both Jupiter and Saturn conjunct Blair’s Mars and Ascendant. 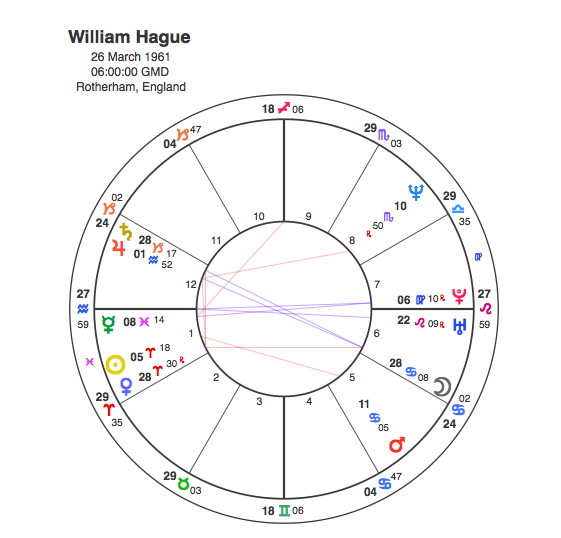 In the run up to the election, his opponent William Hague had Saturn square his. 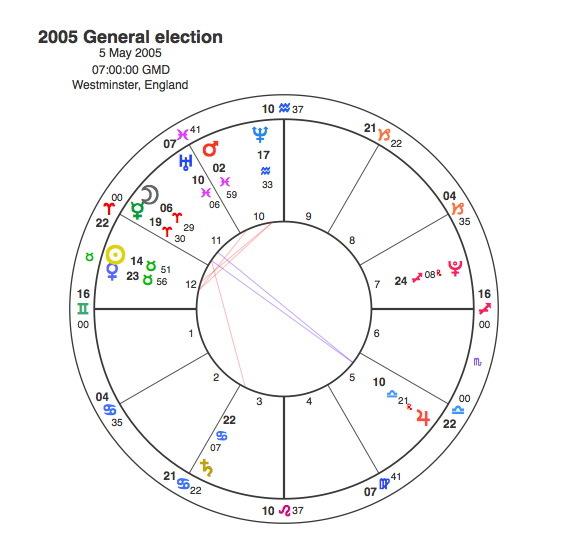 The chart for the 2001 election showed that the Moon symbolising Blair had just moved into Capricorn, and everyone knows how difficult it is to shift a member of that sign. 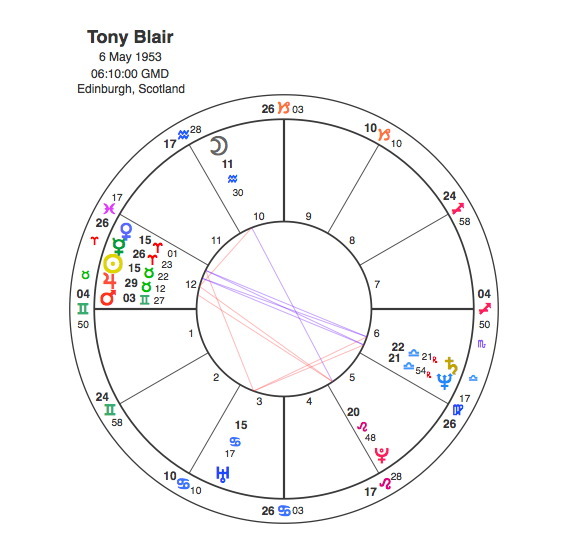 2003 saw the very worst of Blair’s Taurus Sun / Aquarius Moon combination as Neptune conjuncted his Moon adding a large dose of religious zeal to the equation. This transit drove him to reenact the Crusades with the Iraq War. It seems that no one likes a winnable war against a third world country better than the majority of the British electorate as Blair’s Neptune fuelled certainties powered him through the 2005 election. The 2005 chart shows the Moon aspecting both Howard’s Jupiter and Blair’s Mercury. Jupiter was in opposition and going backwards, however and unable to prevent the Moon’s inevitable conjunction with Mercury. One of the advantages of having an election the day before your birthday means the chart has the same Sun is you. Two of Blair’s three victories occurred with the election Suns in conjunction with his. Given this simple fact and the frequency of early May as the date of choice it’s a wonder why we haven’t had an endless stream of Taurean Tories. Blair’s fingers were finally prised from the door of number 10 by his next door neighbour Gordon Brown. Both Brown and Cameron have Leo Moons but whilst Brown’s is conjunct Pluto, Cameron’s is conjunct Jupiter in the 10th and a clearer indication that he would be headed for the highest office would be hard to find. The other factor is in their Suns positions. Cameron has it conjunct Venus in Libra in the first house, an exceptionally good placing for popularity in this image obsessive age. Brown’s Sun is tucked away in Pisces in the 12th a fact that was made clearer every time he was on TV. Brown was made to look ridiculous by the acting Liberal Democrat leader, Vincent Cable, who noted his “remarkable transformation in the last few weeks from Stalin to Mr Bean”. This is such a beautiful quote because it covers the lights in Brown’s chart. The Stalin figure is the Moon in Leo conjunct Pluto, Mr Bean has to be the unaspected Sun in Pisces in the 12th house. This is another interesting chart. Mercury for Labour is retrograde and weak in Taurus. Jupiter for the Tories is in dignity in Pisces. The Moon makes no aspects to either of them, so neither win. Jupiter however is conjunct Uranus which allows the Tories to make a coalition with the Liberal Democrats. Interestingly Labour also attempted to make a coalition arrangement, and this could be linked to Mercury’s mutual reception with Venus in Gemini. However if Mercury and Venus swap places, the Moon is now moving away from a trine aspect to Mercury showing that Brown’s attempt to arrange a mutually reciprocal coalition was doomed to failure. That the Conservative / Liberal Democrat coalition was an uneasy arrangement is shown by the fact that Nick Clegg’s Sun is exactly square David Cameron’s. Labour’s response to their loss was to ditch Brown and replace him with Ed Milliband. Pluto was conjunct Milliband’s Sun when he became Labour leader. Interestingly his Sun is opposite the Moon in the family sign of Cancer and he got the leadership after defeating his own brother, David. So who will win the 2015 election. Transits are not favourable to Milliband as he has Neptune conjunct his Mars. 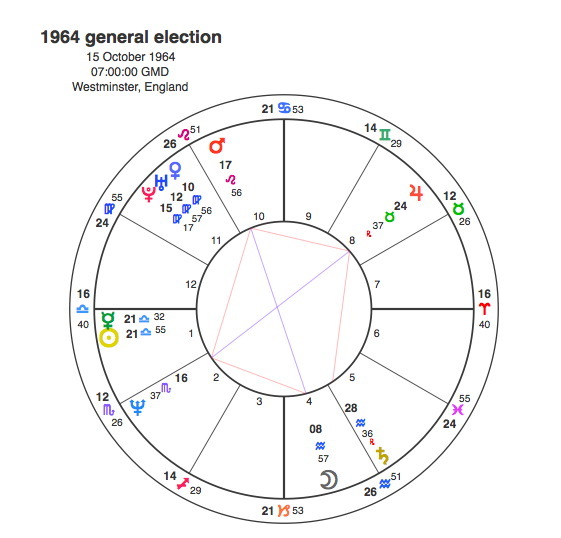 The fascinating thing about the coming election is that we will have 3 political leaders with their Suns in challenging aspects all going through massive Pluto transits. It will mark a watershed in the lives of Cameron, Clegg and Nigel Farage. With their Suns in exact square aspect the coalition between Cameron and Clegg was never likely to survive Pluto’s transit, but it seems that the main event will be the opposition between Cameron and Farage. Not since Thatcher and Benn have we had such an astrologically polarised political combination. But whilst the battles of the the early 80s were symbolically dominated by two powerful T Squares heading in the exact opposite directions, the current two do not have such strongly idealistic driving forces. The chart for the election is unclear. Mercury for Cameron is in dignity in Gemini, Jupiter for Milliband is in Leo. The Moon makes no aspect to either of them, but there are no receptions or conjunctions to Mercury or Jupiter to facilitate further coalitions. Transits give the most likely scenario as an outright win for Cameron as he has Pluto square and Jupiter is sextile his Sun. 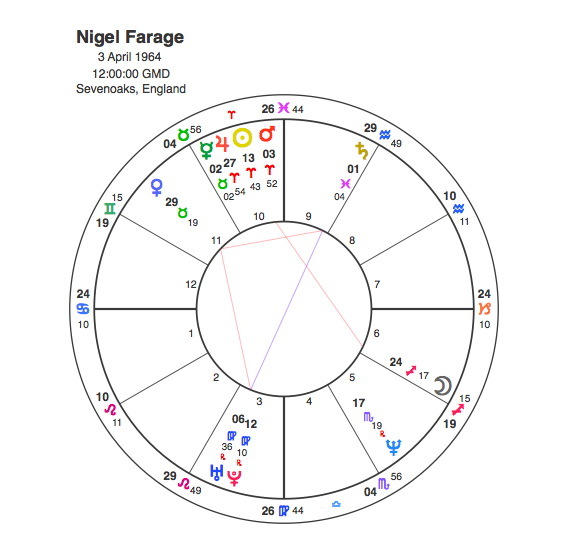 Farage however has Jupiter trine his Sun, so don’t rule out some kind of pre election agreement that offers some concessions to Ukip. This would be a convenient arrangement for the forces of conservatism which have neatly managed to respond to the international banking crisis by placing the blame for Britain’s woes on Europe, immigrants in general and Islam in particular. The real demon of the age is generally depicted by Pluto’s sign position at the time. In Capricorn it points to big business and banks in particular, but the sign is so adept at arranging things to suit them, that its hardly surprising that the population at large seems to have forgotten the cause of the recession and so the 2015 election will be fought on ” Little Britain ” issues. Maybe things will change once Pluto moves into Aquarius, but as the anarchists would say, ” don’t hold your breath “. The fascinating thing about the last 50 years is how closely the election results have reflected the charts of the polls opening. When combined with the transits of the party leaders, the elections become eminently predictable. The anarchist slogan seems to have worked pretty well but if the Tory leaders really wanted to nail it down, they could try opening the polling stations earlier, say 5.30 am. This would put the Taurus Sun directly on the Ascendant. If that happened there would really be no point in any of us turning up. And by the way Professor Lively, Head of the University of Warwick Politics department, here is my 5,000 word dissertation. It may be 40 years late, but we Capricorns do get there in the end. 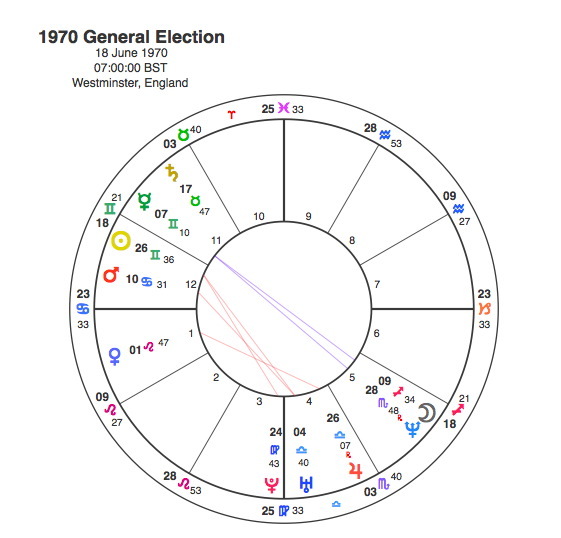 Enjoyed your post on electional astrology (I was browsing to see if you had a recent take on the current drama) and have an electional question for you – why would you draw up a chart for when polls open? I understand if you are planning ahead for, say, a wedding, you would begin the event at the most auspicious time, but I’m not sure predicting an event like an election isn’t different. It seems more like a horary approach, in which case why not do it for when the election was called? My instinct would be for when they close, as that’s when the result will be known and it’s the result you are looking for. Similarly with a football match, I will draw up a chart for full time (or even for the later evening) rather than kick off as that’s when the managers etc. will be experiencing success or defeat. Extrapolating further, to see the winner of a world cup (which lasts a month), would you compare 24 charts for the kick off of the first match or 24 charts for full time in the final? I’d go for the latter as all you want to know is who will be happier at that point. It seems the same question as when polls open or when they close. Just curious about the rationales! Remember I am ‘rediscovering’ astrology and not well experienced! Thanks Adrian and all good questions. There is a difference of opinion about whether to use opening or closing of poll times to assess outcome of an election. My feeling is that its similar to a human being. We do a birth chart for the start of their life to find out what will happen, not the end of it. Likewise if we draw a chart for when the election is called, this would be like drawing a chart for the moment of conception rather than birth. Thats not to say that a chart for the moment of conception ( if we can time it ) or calling an election won’t have valid things to say. But the actual birth chart of the child or election should do it better. I feel the same applies to a football match. A contest chart won’t necessarily give us the result. Astrology is not fate in that way. But it can tell us a lot about what will occur over the 90 minutes and will also tell us whether one team will perform above expectations relative to the other. From this information we can often extrapolate a winner. For something like a World Cup I would look at transits of the managers to predict the winners. In the 2018 one, I got 3 of the semi finalists ( although not England obviously – who in their right mind would have predicted that ). For actual individual matches though, the contest chart with transits comes into play. Thanks for this – it had for some reason gone into my junk folder so took me a long time to notice it! I fully understand your reasoning and am grateful for it. So ‘the early hours’ suggests after midnight. It would not have taken many hours as the manifesto was short and he was in a hurry to get it out, but as a reasonable guess, let’s imagine the document was handed over to the press or the press printed at 2am. Advance your chart by two hours (I set it for Westminster where Peel was living) and see what happens. All of a sudden, I feel, the blueprint of the Tory party is laid bare. Saturn is on the ascendant – how conservative is that? Pluto in opposition (lack of compassion?). Mars and the Moon are conjunct the MC (dominance, and a sense of having the right to be dominant, in a personal chart I’d warn of arrogance). Fast forward to the present moment and look – Pluto and Saturn are together transiting opposite the MC, opposite that Mars and Moon. The tearing apart of the party? Its death? (that’s just my optimism, but if this were a person…) Saturn is a direct square to itself on the ascendant, the Sun is moving in days towards a direct opposition to Saturn on the ascendant… Chiron biding its time close behind. There’s lots of other stuff too (Mars is transiting opposite Mercury), just take a look, it’s fascinating and just advancing your Tamworth chart by two hours opens so much up. I did also look at other historical highs and lows of the party and found that it works with whatever I looked at. Do take a look – it’s fascinating! Thanks Adrian, that’s fascinating. It really makes sense to for Saturn on the Ascendant. Thatcher had the same placing.